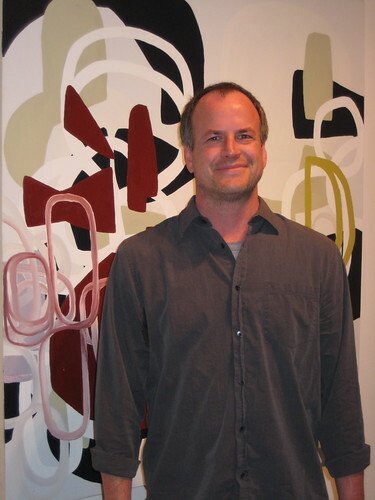 Artist Tim Forcum has been exhibiting in Southern California for over a decade. He manages the great trick of making raw painting composed with an elegant precision. 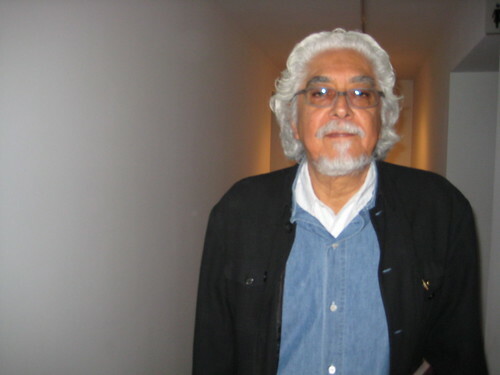 He is a brilliant colorist and a lyrical linesman, drafting strokes of orchestrated infinities with purpose. His show at D.E.N. Contemporary is a must-see if you have any inclination to see abstract painting leap the chasm of where it has all been to where it should be going. The show runs thru April 12. The LA Times reports that the geniuses at the Los Angeles County Museum of Art issued bonds to pay for their glorious expansion (homage to their egos) and now due to financial turmoil, they are stuck paying ridiculously inflated rates to bondholders. All I gotta say is those people – the top art institutional administrators – they are just not as smart as their titles, positions and attitudes all imply. And is costing LACMA (actually, we the people) millions. Artist Edward Walton Wilcox and one of his large new paintings on display at Ambrogi Castanier Gallery. His solo show opened in early March and is filled with apocalyptic paintings of the demise of Los Angeles, physically and spiritually. The exhibition is entitled Are You Going With Me? and it runs thru March 29. It combines masterful realistic painting with a creepy sense that we are living in the end times. I hope Edward is wrong about the philosophy and right about great art appearing in galleries. A throng of people Wednesday night at Ace Gallery, Beverly Hills during a performance by female bodybuilders who were the subject of artist Martin Schoeller’s photographs on display at the gallery. Ace Gallery, Beverly Hills presented a spectacle to open a quartet of solo shows. The main gallery?€™s feature, photographer Martin Schoeller?€™s portraits of female bodybuilders, was transformed from the merely pictorial to the performance as some of the women Schoeller has shot were modeling on a stage in the center of the gallery for a crowd that included Los Angeles Mayor Antonio Villaraigosa, celebrity chef Wolfgang Puck and a flow of 500 art world denizens at any given time. On a Wednesday! 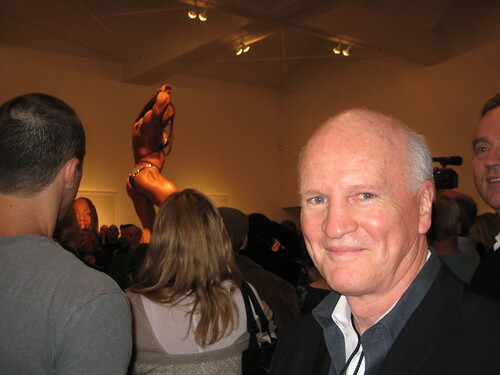 In addition to the photos, sculptor Robert Graham has new work, 3-D and 2-D, on display and it was the living master himself whose work was most complemented by the flexing glamazons. Graham?€™s delicate figure paintings are the sort that would die with one mistake of the loosest paintbrush in town ?€“ and yet, they are more precise capturings of the human form with all its potential energy to be released. Exquisite rendering is almost never this perfectly expressionistic. There are also small displays by sculptor Judy Fox and 2-D cut-up Justin Pearce on display. Ace Gallery Beverly Hills is at 9430 Wilshire Boulevard. Artist Martin Schoeller’s poses next to one of his large-scale photographs on display at Ace Gallery, Beverly Hills. 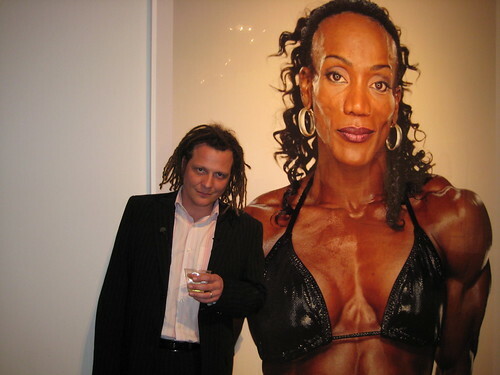 Legendary art dealer Doug Chrismas at his Ace Gallery, Beverly Hills during a performance by female bodybuilders who were the subject of artist Martin Schoeller’s photographs on display at the gallery. The performance by female bodybuilders who were the subject of artist Martin Schoeller’s photographs on display at the gallery. Los Angeles Mayor Antonio Villaraigosa was among the throng at Ace Gallery, Beverly Hills during a performance by female bodybuilders who were the subject of artist Martin Schoeller’s photographs on display at the gallery. 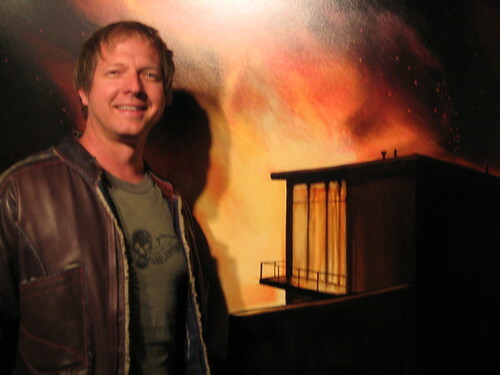 Artist Robert Graham at the opening reception of his exhibition at Ace Gallery, Beverly Hills.